Hi foodies. Welcome to AYESHA'S KITCHEN. Today's recipe is an easy, creamy, mildly spiced Indian dish / Indian recipes with vegetables. Vegetable korma is a curry based dish with the flavor of coconut and cashews. This version of vegetable korma is a mildly spiced curry without chili powder and used pepper powder instead. Indian food recipes include a wide variety of vegetarian and vegan recipes. In this veggie korma recipe, vegetables are cooked and mingled in a creamy coconut cashew gravy which really makes this dish finger licking good. 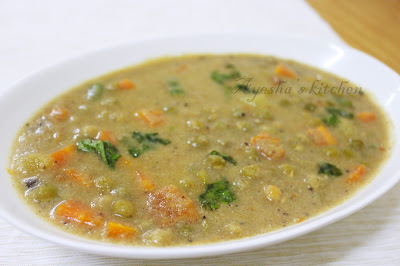 Do try this mix veg recipe/vegan korma recipe which can please a crowd for sure. This is best when accompanied with chapathi or paratha. Here is the recipe showing how to make korma curry/veggie curry recipe/veg indian recipes/vegan curry recipe/ vegetable side dishes gravy. Heat a vessel with oil. Add in the sliced onion and saute well. Once onion turned to golden lightly, add the paste of green chilies, ginger, garlic, fennel seed. Mix well. Keep the flame to medium. Now add tomato and cook for few minutes with lid closed. When the tomato is done, add cubed carrot, potato, beans along with some salt. Let it cook for a while and then add pepper powder, coriander powder, turmeric powder(optional, i skipped), garam masala powder and saute well. When done, add half a cup of water. Cook for few minutes until the vegetables get cooked and mixed well with the gravy. By the time grind the coconut, soaked cashews and fennel seed(perum jeerakam) with some water, to a fine paste. Now add this coconut mixture to the vegetable gravy and cook on a medium flame for few minutes or until the veggies are well mixed in the gravy. Do not overcook. If the curry is too thick, add required water too. Heat some oil in a pan and fry the chopped small onions and curry leaves. Pour it over the curry for seasoning. Serve hot with Chapathi, Paratha, Ghee rice, Puri, etc..